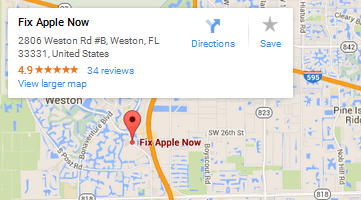 Below you can find driving directions from Google Maps to help you get from Royal Palm Beach to your nearest Fix Apple Now store, situated in Weston. You can either copy the driving instructions below or click here for a larger map and driving directions. Are you experiencing a problem with your Apple device in Royal Palm Beach? If so, talk to Fix Apple Now today. We have years of experience to draw upon when it comes to resolving problems with Apple devices, so why not talk to us today if you're home button won't work, you're seeing “no SIM card” errors, you have a landscape keyboard, your incoming call screen is not displaying, your phone is overheating or you've got a red screen? Maybe you're seeing enlarged icons or cannot heart during phone calls? Then contact us. We can mend, fix, replace, reset, restore or replace your iPhone 4,5 or 6, iMac, Apple Mac, MacBook Pro or Air, iPad or iPod. Our engineering team are amongst the most skilled in the industry and can fix all kinds of Apple devices. You can count on us to meet your expectations every time, so why wait any longer to get in touch if you require Apple repair services in Royal Palm Beach? Follow Florida's Turnpike and FL-869 S to Royal Palm Blvd in Weston.